Soltaniyeh was the capital of the Ilkhanate, an empire of Mongolian origin that ruled over Persia in the 13th and 14th centuries. The city’s main remaining feature is the ‘Dome of Soltaniyeh’, which houses the mausoleum of the Ilkhanid khan Öljeitü. This building is considered a key monument in the history of Islamic architecture: it is the oldest double-shell dome in the world. The octagonal building is crowned with a 50m-tall dome covered in turquoise blue glazed bricks and surrounded by eight slender minarets. The WHS comprises 13 other locations besides the Dome. They include other mausolea and tombs, and also the remains of the former city and surrounding pasture. This nomination carried the Epic Subtitle “Dome of Soltaniyeh; the pasture which became the capital city of the empire”. Unfortunately it was not brought forward to the inscription, now the name of this WHS is a simple Soltaniyeh. 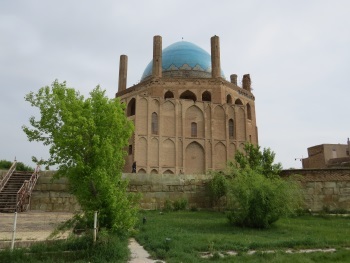 The original title though hinted at the Mongol origins of the site: this is the best representation of the heritage of the Mongolian Ilkhanids among Iran’s WHS, although the newer parts of Takht-e Soleyman and the Blue Mosque of Tabriz also date from this era (13th-14th century). The famous Dome of Soltaniyeh can already be seen from miles away. The light-turquoise structure on top of a 50 meter high octagonal building still towers above everything in its surroundings, including the current town of some 6,000 souls. This is a very flat landscape, the Mongolians are said to have chosen this spot to settle because of the vast pastures it provided for their horses. The building was made to house the mausoleum of Ilkhanid khan Öljeitü. Its interior at the moment is fully covered in scaffolding, therefore unfortunately it is impossible to see anything of the inner construction of the dome. This repair work has been going on for a long time already, apparently since 1994. The ongoing restoration prompted me to look at the Management Plan which Iran submitted with the nomination. The 1-, 3- and 5-year action plans seem to be detailed. However only a budget of 300,000 dollars a year was available, from which they also have to pay the regular upkeep of the site (electricity bill, salaries etc). Through annual projects the Iranian state provides for the costly maintenance of the monument. They started the restoration with replacing the missing tiles on the outside of the dome. Now they take on the interior. One can climb the stairs to the second and third floors, and walk around in the galleries on the outside of the building. This is enough to see the the remarkable decoration of the structure. There are some ubiquituous blue tiles of course, but also stucco design and intricate brick work. Just as at many other sites that I visited in Iran, earthquakes have also here led to many cracks in the walls and ceilings. In the vicinity of Öljeitü’s mausoleum there are 13 other sites that belong to this WHS. Our tour group made a short coffee stop (picknick-style, with our own packed ingredients) at one of them: Chelebi Oghlu. This is also a mausoleum, built at the same time as the large mausoleum of Soltaniyeh. A Sufi saint lies buried here, and a Sufi shrine developed in this place. Not a spectacular sight, but enough to remind you that this site once covered a capital city of an empire. A nice bit of trivia about Soltaniyeh is that khan Öljeitü, who lies buried here, was a bit shaky in his religious beliefs. He was baptized as a Christian, and took the name ‘Nicholas’. Afterwards he dabbled in Buddhism and Sunni Islam, before finally choosing Shia Islam (and changing his name to Muhammad). He suddenly was so sure of this road that he planned to transfer the bodies of Imam Ali and Imam Husayn from their resting places in Karbala, Iraq (the holiest site in Shia Islam after Mecca and Medina) to Soltaniyeh. Maybe unfortunately for the current Islamic Republic of Iran, this did not materialize. Soltaniyeh is an easy trip from Tehran on the way to Ardabil or Tebriz. Entrance fee was 200,000 rials (6 usd). Inside there are repairs ladders and small array of repairs works. It's possible to climb to the second level and walk around in the inside gallery and than go upstairs to outside circle. There are remains of some very fine tilework on some ceilings. However the building itself is a bit dilapidated. There are many cracks everywere, a thing you probably should expect from 700-old building. Some cracks are covered with simple patches and some with laser ones, which record speed of wall movement. Unfortunately thus impressive dome is substantially the only witness of once very prosperous and bustling trading city. I just came back from Iran. My first stop to the western part of the country was at Soltaniyeh. Words can't express the beauty and delicacy of this massive structure. It sits in total harmony with it's surroundings. The blue tiles against the nutural brown bricks work wonderful patterns. Yet, funds are lacking and the resstoration of this building should have been finished years ago. Upon our arrival, a celebration was underway as Soltaniyeh was added to Unesco's World Heritage List. The governor of Zanjan was visiting the site, and we were given a nice bowl of "Aash" or thick Persian soup. Don't miss this place. Not too far from Tehran, and on the way to the city of Zanjan. Easy-to-find Soltaniyeh lies just off the main highway Qazvin - Zanjar, some 300km east of Teheran. Located in a Former Capital: Soltaniyeh used to be the capital of Ilkhanid rulers of Persia in the 14th century. 39 Community Members have visited.